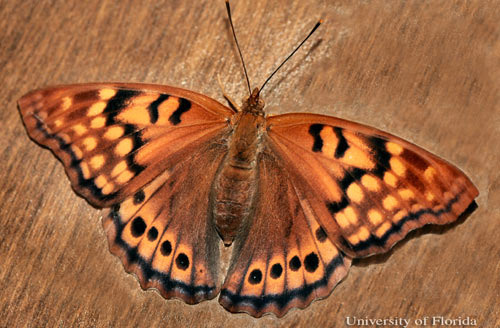 The tawny emperor, Asterocampa clyton (Boisduval & LeConte), is a medium sized, rather non-descript butterfly that is particularly common in riparian forests, but is also found in dry woods and suburbs (Opler et al. 2011). It is often found in association with the hackberry emperor, Asterocampa celtis (Boisduval & LeConte), which is usually more abundant. Competition between the two closely related species may be reduced by the fact that tawny emperor larvae often feed on older foliage whereas hackberry emperor larvae prefer new foliage (Cech & Tudor 2005). Figure 1. A newly emerged, adult female tawny emperor, Asterocampa clyton (Boisduval & LeConte), clinging to its pupal exuviae. Photograph by Donald W. Hall, University of Florida. 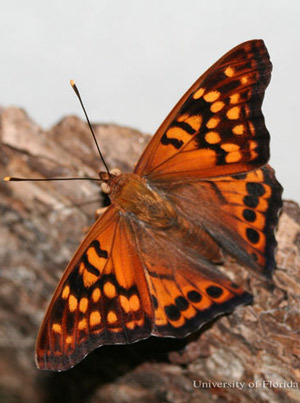 Detailed historical information on the taxonomy and nomenclature of the tawny emperor is found in the Catalog of the Butterflies of the United States and Canada (Pelham 2008). 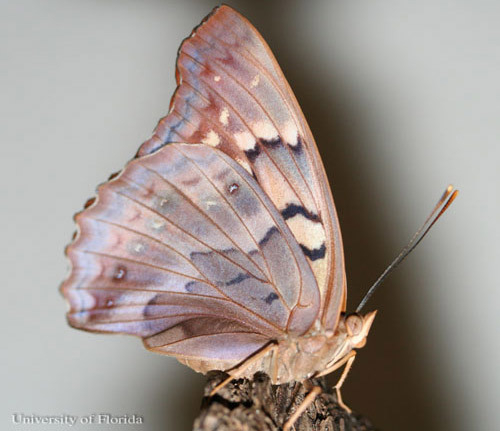 The tawny emperor is found from southern New England south to Florida, and west to North Dakota and southern Arizona (Opler and Krizek 1984, Opler et al. 2009). It is common in northern and central Florida in association with its host plants but is more local in southern Florida (Minno et al. 2005). Adults: The wing spread of adults is 2 – 2 5/8 inches (5 – 6.7 cm) (Allen1997). Females are much larger than males (Minno and Minno 1999). Adults are somewhat variable regionally and the variants have previously been considered separate species (Glassberg et al. 2000). Gatrelle (1999) has published photographs of some of the color variants of Asterocampa clyton and Asterocampa celtis that occur in South Carolina and Florida. All specimens pictured here are from Alachua County, Florida. The wings are brown to orange-brown. 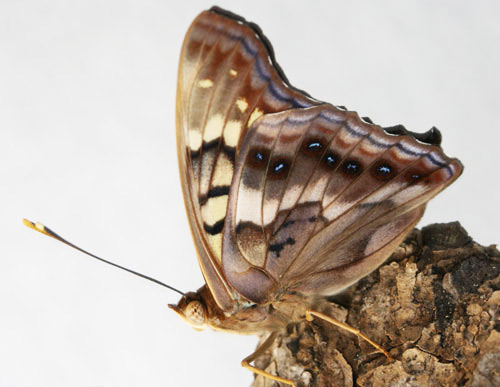 Adults may be distinguished from those of the hackberry emperor by the two complete dark bars in the front wing cell and the lack of a sub-marginal dark eyespot on the front wings. Also, the hackberry emperor has rows of pure white spots on the upper front wings that are pale yellow in the tawny emperor. Males can be differentiated from females by their smaller size and the concave outer margins of their wings. Figure 2. An adult female tawny emperor, Asterocampa clyton (Boisduval & LeConte), with wings open. Photograph by Donald W. Hall, University of Florida. Figure 3. An adult female tawny emperor, Asterocampa clyton (Boisduval & LeConte), with wings closed. Photograph byDonald W. Hall, University of Florida. Figure 4. An adult male tawny emperor, Asterocampa clyton (Boisduval & LeConte), with wings open. Photograph by Donald W. Hall, University of Florida. Figure 5. 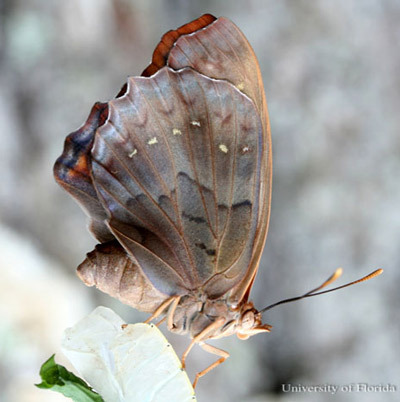 An adult male tawny emperor, Asterocampa clyton (Boisduval & LeConte), with wings closed. Photograph by Donald W. Hall, University of Florida. Eggs: Eggs are white, but become darker before hatching. Figure 6. Eggs of the tawny emperor, Asterocampa clyton (Boisduval & LeConte). Photograph by Donald W. Hall, University of Florida. Figure 7. Eggs of the tawny emperor, Asterocampa clyton (Boisduval & LeConte), one day before hatching. Photograph by Donald W. Hall, University of Florida. Larvae: Full grown larvae are approximately 1.5 inches (3.8 cm) in length (Minno et al. 2005). The body is green with yellow and white longitudinal stripes, a dark blue-green mid-dorsal line, and a pair of short tails on the posterior end. The shield-like head has short spines on the sides and a pair of short black-tipped horns on top (Minno et al. 2005). See Wagner (2005) for excellent drawings comparing the cephalic horns and lateral spines of the tawny and hackberry emperors. Figure 8. A fourth instar larva of the tawny emperor, Asterocampa clyton (Boisduval & LeConte), lateral view. Photograph by Donald W. Hall, University of Florida. Figure 9. A full-grown larva of the tawny emperor, Asterocampa clyton (Boisduval & LeConte), lateral view. Photograph by Donald W. Hall, University of Florida. Figure 10. A full-grown larva of the tawny emperor, Asterocampa clyton (Boisduval & LeConte), dorsal view. Photograph by Donald W. Hall, University of Florida. Figure 11. Anterior view of head of a larva of the tawny emperor, Asterocampa clyton (Boisduval & LeConte), showing cephalic horns. Photograph by Donald W. Hall, University of Florida. 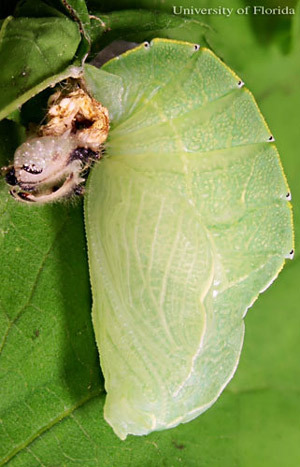 Before pupation, the prepupal larva spins a silk pad and attaches to it with its terminal prolegs. It then becomes inactive and fades to a pale green color. Figure 12. Pre-pupal larva of the tawny emperor, Asterocampa clyton (Boisduval & LeConte). Photograph by Donald W. Hall, University of Florida. 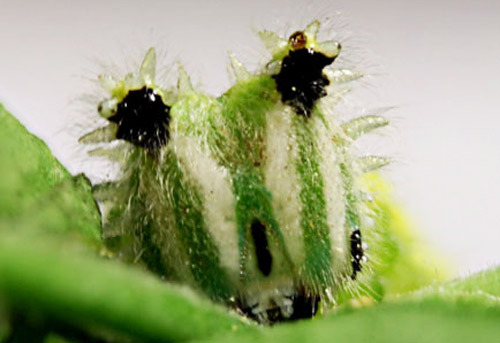 Pupae: Mature pupae are green with small yellow spots and a yellow mid-ventral line that branches and runs to the tips of two horns at the anterior end of the pupa. There are also two yellow lateral lines and diagonal yellow lines on the sides of the abdomen. Each abdominal segment has a dark dot at the anterior end on each side of the mid-ventral line. The pupa is attached to a silk pad by the cremaster (hooked spines on tip of pupa). Pupae are virtually identical to those of the hackberry emperor except for the thin yellow lines that are white in the hackberry emperor. Figure 13. Lateral view of recently pupated tawny emperor, Asterocampa clyton (Boisduval & LeConte). Note the fifth (last) instar larval exuviae to the left of the pupal point of attachment. Photograph by Donald W. Hall, University of Florida. Figure 14. Dorsal view of pupa of the tawny emperor, Asterocampa clyton (Boisduval & LeConte). Photograph by Donald W. Hall, University of Florida. There is a single generation in the northern United States (Opler & Krizek 1984, Opler et al. 2011), but there are three generations in Florida and southern Louisiana (Israel 1982, Minno et al. 2005) and probably Texas, southern-most parts of the other Gulf states and Arizona. Adults feed on tree sap, rotting fruit, carrion, and dung, but almost never on flowers (Minno & Minno 1999, Opler et al. 2011). 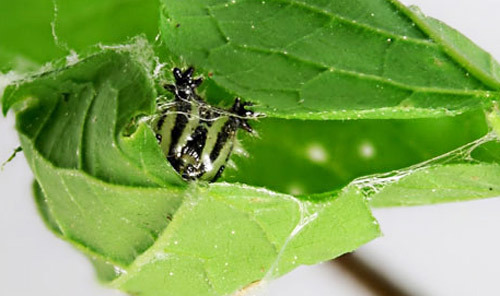 Males perch on foliage in full sun to wait for females (Opler et al. 2011). 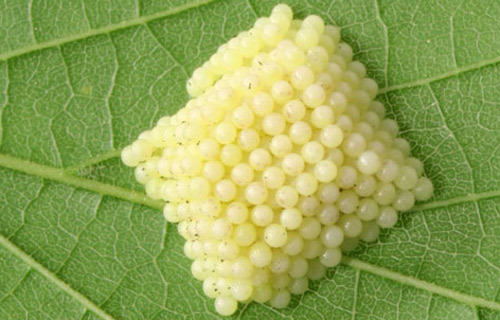 Eggs are laid in large groups on bark or the undersides of mature leaves (Israel 1982, Opler & Krizek 1984, Opler et al. 2011). The eggs are stacked in an arrangement that likely affords exposure of the smallest percentage to "surface-parasitizing" parasitoids (Friedlander 1985). The cryptic young larvae feed gregariously through the third stadium, moving as a group and often passing by numerous leaves before settling at a new feeding site. The larvae follow silk trails that are laid down by other larvae to reach the new feeding areas (Stamp 1984). These feeding migration patterns may serve as a defensive strategy against predators and parasitoids that might use the presence of damaged foliage and/or feces to locate the aggregations of larvae (Stamp 1984). 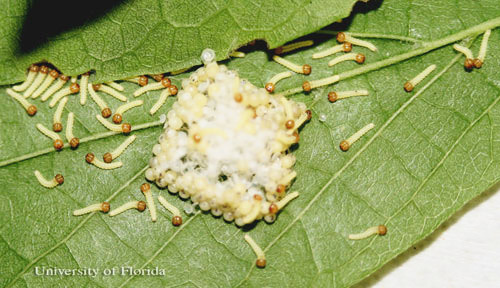 Young larvae molt on the undersides of leaves or in leaf shelters made by tying leaves together with silk (Stamp 1984). 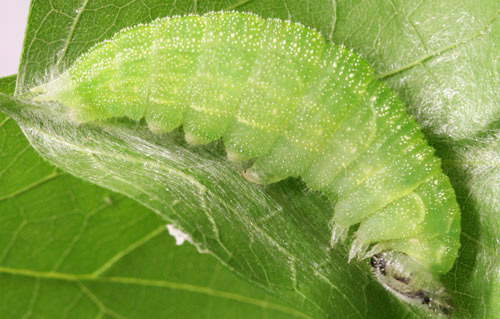 Older larvae are solitary. Figure 15. Newly hatched larvae of the tawny emperor, Asterocampa clyton (Boisduval & LeConte). Photograph by Donald W. Hall, University of Florida. Figure 16. Two-day-old gregarious larvae of the tawny emperor, Asterocampa clyton (Boisduval & LeConte). Photograph by Donald W. Hall, University of Florida. Figure 17. 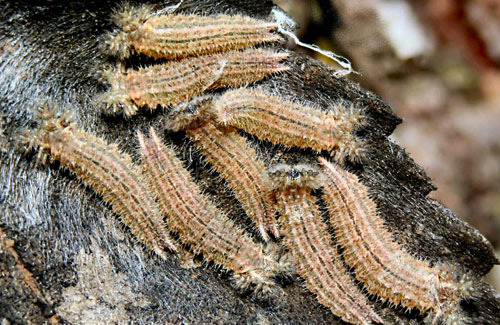 Eleven-day-old (third instar) gregarious larvae of the tawny emperor, Asterocampa clyton (Boisduval & LeConte). Photograph by Donald W. Hall, University of Florida. When threatened, young larvae swing their spiny, shield-like heads and attempt to bite with their mandibles—behavior that may defend against ants and other small predators (Stamp 1984). 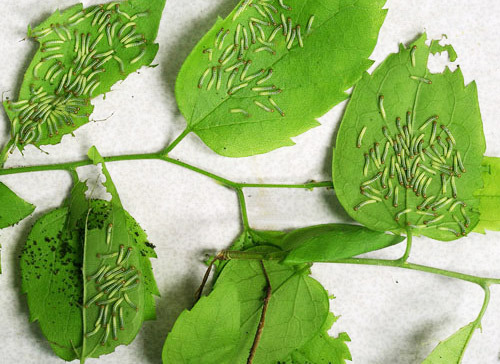 Larvae that develop under the short photoperiod conditions of fall turn to brown-colored third instars and overwinter in groups of approximately ten in a hibernaculum constructed by tying leaves together and attaching the leaf petioles to the stem with silk so the hibernaculum remains on the tree throughout the winter (Cech et al. 2011, Cech & Tudor 2005, Scott 1986, Stamp 1983). 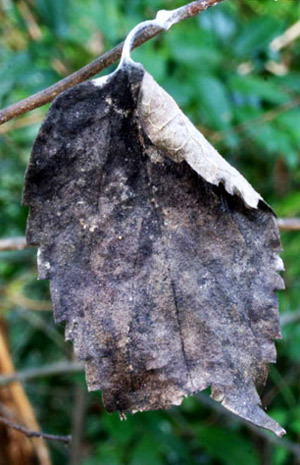 In some hibernacula, a single leaf or part of a leaf is used that dries and curls to form the shelter. Figure 18. A hibernaculum of the tawny emperor, Asterocampa clyton (Boisduval & LeConte), formed from two leaves. The galls on the hibernaculum were formed by hackberry psyllids. Photograph by Donald W. Hall, University of Florida. Figure 19. A hibernaculum of the tawny emperor, Asterocampa clyton (Boisduval & LeConte), formed by curling the edge of a single leaf. This small hibernaculum contained five larvae. Photograph by Donald W. Hall, University of Florida. Figure 20. Overwintering larvae of the tawny emperor, Asterocampa clyton (Boisduval & LeConte). Photograph by Donald W. Hall, University of Florida. 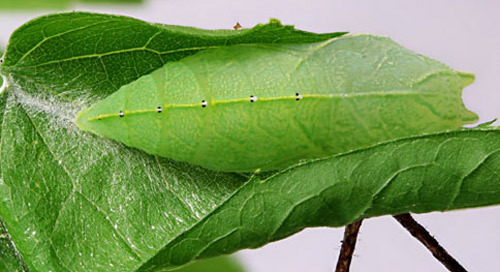 As the new foliage begins to appear, the larvae come out of hibernation and begin to feed after which they regain their green color. A few days later they molt to the next instar. For a period of time they continue to return to the shelter of the hibernaculum after feeding. Figure 21. Post-hibernation larvae of the tawny emperor, Asterocampa clyton (Boisduval & LeConte), on hibernaculum. Photograph by Donald W. Hall, University of Florida. Figure 22. Fourth instar larva of the tawny emperor, Asterocampa clyton (Boisduval & LeConte), in leaf shelter. Photograph by Donald W. Hall, University of Florida. 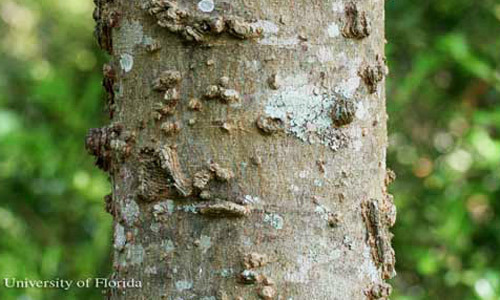 The larval hosts of the tawny emperor are hackberry trees (Celtis spp.) in the family Celtidaceae. 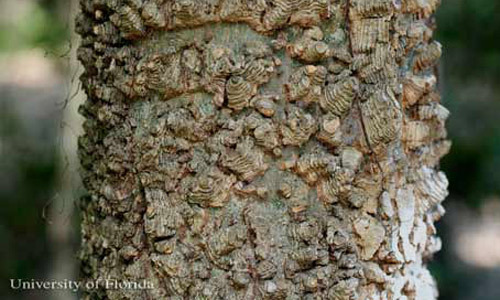 The two most common hackberries in the eastern United States, the more northern hackberry, Celtis occidentalis Linnaeus, and the more southern sugarberry, Celtis laevigata Willd., can usually be recognized by the slightly to heavily warty appearance (or pronounced ridges on mature Celtis occidentalis) of the bark. 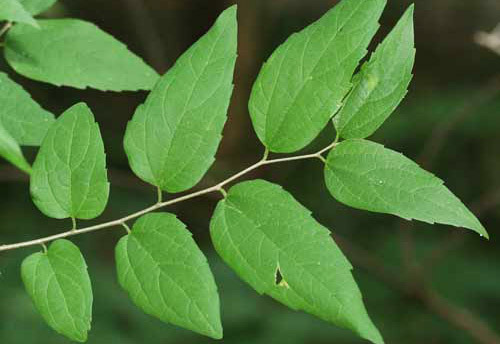 More information and a key to the Celtis species is available at efloras.org (2009). Figure 23. Sugarberry, Celtis laevigata Willd., a host of the tawny emperor, Asterocampa clyton (Boisduval & LeConte). Photograph by Donald W. Hall, University of Florida. Figure 24. Warty trunk of sugarberry, Celtis laevigata Willd., a host of the tawny emperor, Asterocampa clyton (Boisduval & LeConte). Photograph by Donald W. Hall, University of Florida. Figure 25. Heavily warty trunk of sugarberry, Celtis laevigata Willd., a host of the tawny emperor, Asterocampa clyton (Boisduval & LeConte). Photograph by Donald W. Hall, University of Florida. Figure 26. Hackberry, Celtis occidentalis L., a host of the tawny emperor, Asterocampa clyton (Boisduval & LeConte). Photograph by Donald W. Hall, University of Florida. Tawny emperor larvae are rarely sufficiently numerous to seriously affect host trees. However, population outbreaks have been recorded (Israel 1982). Control measures are neither required nor recommended. Various insect parasitoids of eggs and larvae and general predators aid in regulation of tawny emperor populations (Israel 1982, Stamp 1984). Friedlander TP. 1985. 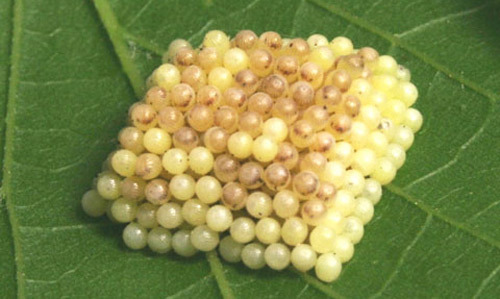 Egg mass design relative to surface-parasitizing parasitoids with notes on Asterocampa clyton (Lepidoptera: Nymphalidae). Journal of Research on the Lepidoptera 24: 250-257. Gatrelle RR. 1999. 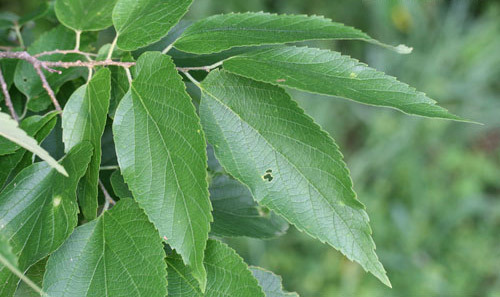 A comment on Friedlander's Asterocampa (Nymphalidae: Apaturinae): designation of neotypes for A. celtis and A. clyton. The Taxonomic Report of the International Lepidoptera Survey 1: 1-6. Israel ML. 1982. Outbreak of Asterocampa clyton (Nymphalidae) in Louisiana, USA. Journal of the Lepidopterists' Society 36: 234-235. Minno MC, Minno M. 1999. Florida Butterfly Gardening: A Complete Guide to Attracting, Identifying, and Enjoying Butterflies of the Lower South. University Press of Florida. Gainesville, Florida. 210 pp. Stamp NE. 1983. 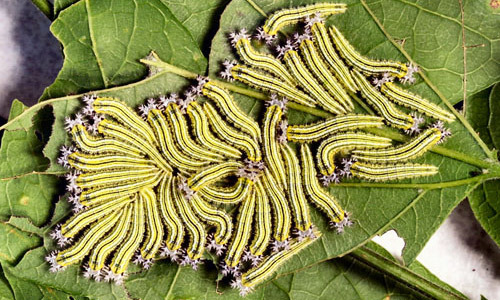 Overwintering aggregations of hackberry caterpillars (Asterocampa clyton: Nymphalidae). Journal of the Lepidopterists' Society 37: 145-146. Stamp NE. 1984. 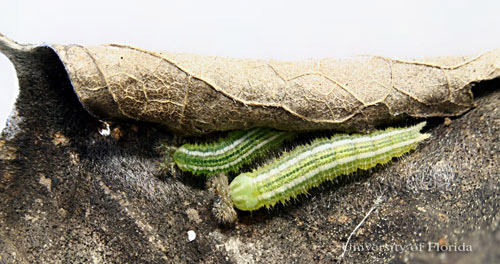 Foraging behavior of tawny emperor caterpillars (Nymphalidae: Asterocampa clyton). Journal of the Lepidopterists' Society 38: 186-191. Publication Date: May 2012. Latest Revision: March 2016. Reviewed: February 2019.